Not sure if it's very noticeable, but the purple is actually a gradient, I thought it would bring more depth to the design. I used H&M Beauty Bandit as basecolor and sponged some OPI Funky Dunkey (which I'm holding in the picture) and Essence Passion For Fashion on top of it. The writing is done with China Glaze Ink, a striper polish. Hope you like it! Did you use a calligraphy pen? I used a black striper polish (China Glaze Ink). Beautiful - love the gradient too. I love it, the gradiënt and your freehand work. Let me just tell you....this looks amazing! So simple but sooo pretty, it should be on a nail strip! I love the color combos, and the thick black font really pops! You are such an inspiration, and im so glad that i've subscribed to your blog! 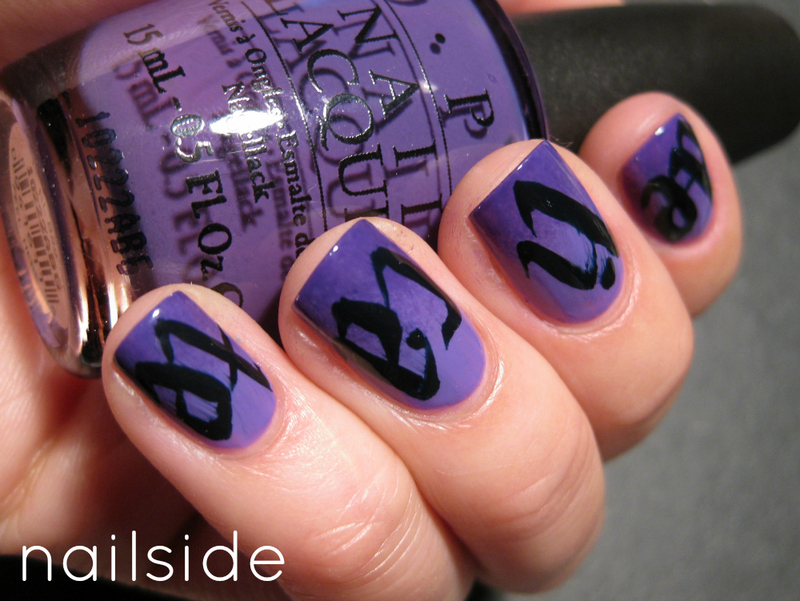 Wow, I am a huge typography nerd and I never thought to incorporate it into manis! Love this! Thinking a gold monogram mani is in order! I totally see the gradient! I'm amazed how you pulled off the calligraphy. Looks gorgeous! That is wicked. I love it. For sure it looks like a calligraphy pen. You did an amazing job. Oh, I love this! Great unique take on the prompt and you pulled it off perfectly! hahaha I love that you *wrote* delicate! This is sooo cool! I love it! I love this for so many reasons!! The typography nerd in me collided with my nail addiction, and now I must try this. I was searching for inspiration for this year's delicate print prompt. Guffaw! So clever. And it looks good too!